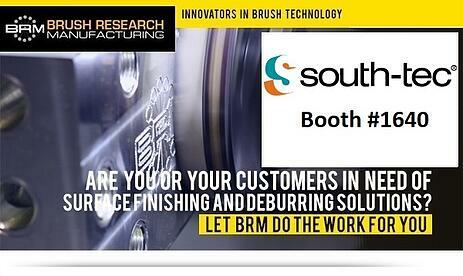 Brush Research Manufacturing (BRM) will showcase surface finishing solutions at SOUTH-TEC 2017. Meet us in Booth #1640 from October 24-26 at the TD Convention Center in Greenville, South Carolina (USA). Don’t miss your chance to learn more and talk to our Technical Team. Request a meeting with BRM at SOUTH-TEC 2017.